No, not that 8 Mile! The past two weeks, I've run 22 miles each, culminating with an 8 mike run on the Saturday. These two weeks, and especially these two runs, could not have been any different. We can start with the distances and finish times of each run: July 24-8.01 miles-103 minutes (1:43, or 12:51 miles) vs. July 31-8:36 miles-76 minutes (1:16, or 9:04 miles). The two big factors were the weather and my body (aren't those what affects everyone?). The past two weeks, something has been (not) seriously wrong with my left shin and calf. My foot wouldn't flex when I pushed off the ground. I kept running anyway. Finally, I had enough last Monday (July 26), called my support crew (read: chiropractor), and made an appointment for the next afternoon. I also tried running on the treadmill to see if it made a difference. It did, but I hate the treadmill a lot more in the summer. 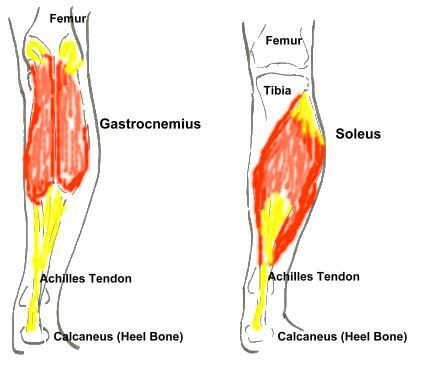 At the appointment, she told me something was up with my soleus Additionally, I've been to the walk-in twice in the last four weeks. The first time, 2 weeks ago, I went through a battery of tests, and was given weak antibiotics, because they couldn't find anything wrong with me (I had been coughing for 2 weeks at this point). I went back this Friday, saw a different doctor, and was put on the nebulizer for a breathing treatment, as the cough and wheezing were worse. She checked out my chest xray, and decided that I had had bronchitis for over a month. Awesome, new meds: z-pack, a steroid, and an inhaler. Freaking great! As for the weather last week versus last week, it was diametrically opposed (I think). July 24, at 7:30-9:30 it was 80-82, and the Real Feel was between 98 and 102, due to 80% humidity in the morning (got to 92%, no rain). July 31, the climate was drastically different. The temps from 7:30 to 9 ranged between 63 and 68, with a feel of 63-70 in the sun. In the shade, I actually shivered on my first loop. The courses were also a bit different. I have a 4 mile (4.18) loop that I use regularly through some of the neighborhoods around mine. On the first Saturday, it took me 44 minutes to complete the first loop of this. I felt awful. I was drenched in sweat by the end of the 2nd mile. Soaked completely through my shirt and shorts. My leg was in pain. I did my usual water stop in my garage, and then proceeded to change the route. I could not mentally or physically do that loop again. So, I ran up and down the side streets on my usual two mile loop, making it up to about 4 (3.83) for a grand total of 8.01. The 3.83 took me an hour, and I had to walk several times due to pure exhaustion. This week, I was able to do the 4.18 mile loop twice. The first time through, I felt awesome. It was like I was in a race. The chiropractor visit combined with some serious aided stretching (thanks to the Wife), and I ran at a pace that was, for me, gang busters (great vocabulary, Teach). Keeping up a full head of steam, I completed the first loop in 36:36 (8:45 miles, which is pretty good for me). I got my water, took my inhaler, and headed out again in under 2 minutes. My stride hadn't changed much, and it was really good. As I went up "the hill," I felt as though I was flying up it (this sucker rises 100ft in a little under a quarter mile, that's more than a 4% grade). In fact, I felt so good at the top, that I considered doing another 2-4 miles after this loop, but then I decided not to push it, based on my calf/shin. It was probably a good idea, because, though I really felt good on this round of the loop, by the time I got to the last half mile, I was ready to be done. On the entire run, I didn't sweat through my shirt, let alone my shorts. Conditions were SO much better! When I finished on the 24th, I felt enormous relief: it was over. I hadn't felt that awful in a long time when I finished a run. This week, when I finished, I felt enormous relief: I KILLED THAT RUN! It gave me a lot o hope, because I again was contemplating at least 2 more miles when I came inside. If I had about an hour more (S had to go to a baby shower in NY, and I'd feel guilty coming in from my run 20 minutes before she left), I absolutely would have. Saturday made me feel as though I was back on track. There are roughly 70 days until the ING Hartford Half-Marathon (this year, I'm taking it easy). I promise not to wait 50 days for my next post, like I did last year. I'll be ready on time, and feel a lot better. Total mileage 83 (July 2009, I did 92, not bad, considering I run 1 day a week less, and I'm not training for a marathon). On this run, I only listened to my Top 25 Played list on the iPod. Since changing computers, this has changed a bit, so the most a song has been played in the past 3 months has been 14 times. Still, here's what I rocked out to on the fast run, this past Saturday. This week, we head to the Cape. No Brew Run. No Falmouth RR. We're a week too early. Found a race in Harwich, and I'm filling out and mailing my application tomorrow. I'm excited to explore my vacation site on a race. Fun times, wandering through a town. * Those 3 posts included several double posts, like this one. Thanks for finally talking about > "8 Mile and July 2010 in a nutshell" < Liked it! “return the favor”.I'm attempting to find things to enhance my site!I suppose its ok to use a few of your ideas!! He constantly kept preaching about this. I'll forward this information to him. Fairly certain he will have a very good read. Many thanks for sharing!